BTC seem to want to go up with positive volume momentum, but gets slapped down every so often. I feel the majority of traders expect this thing to go down, at this time, but I feel the bull side has potential as well. I am fairly suspicious as I believe this market is very manipulated. But either way will be a significant move. This is 100% going to break down again below the green line because it is not an impulse wave structure. This is a corrective b or x wave. I have adjusted my stops, but letting the profits run so far. I've seen a lot of good traders go short at this time. So far I am sticking with my setup. What are your projections and setups? My setup is: BTC can rise to 4350 before dropping to 3500, but the drop can happen any time now and it does not need to go that high. BTC's price needs to break the $4,200 - $4,500 band and stay above it for a while before it can moon. The weekend may see another attempt while volumes are lower. 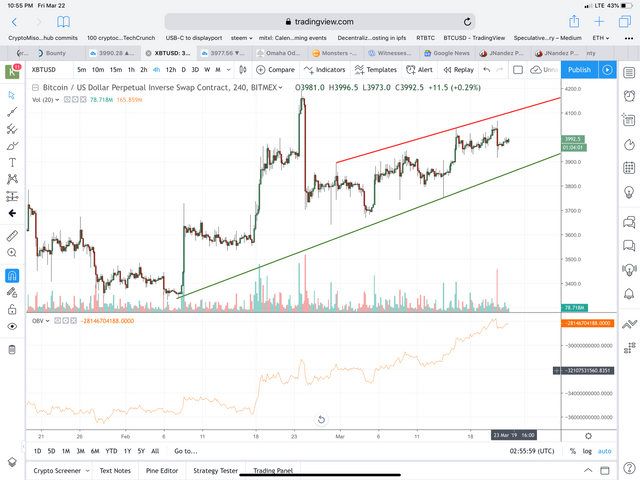 We can see that we are within an ascendent channel, although the major changes are not yet to happen, we can see that the price is going up slow and steady.